I always wash quilts when I am done because I am usually quilting a vintage top and they can be pretty dirty and need a good wash. I also like the softness of a washed quilt, and the crinkled look that happens when washed. I used Hobb’s Tuscany wool batting for this quilt, but I find that it washes up nicely. I washed it in cool water in the machine on the delicate cycle, and dried it in the dryer on low temperature. Here is how I added the binding. Remember this was a vintage top, it was not square or even so the binding wont be perfect either. 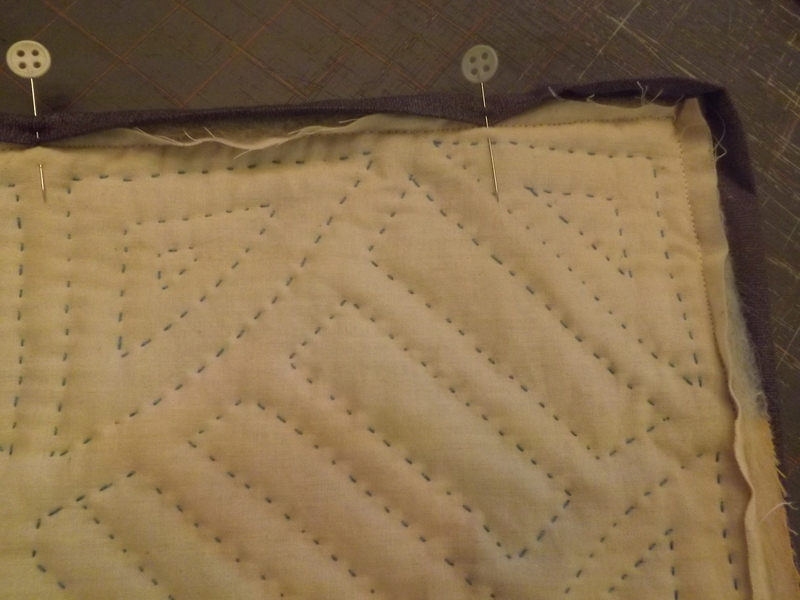 I like to use straight grain binding on quilts with straight edges. Straight grain does not stretch while I am machine stitching it to the quilt. 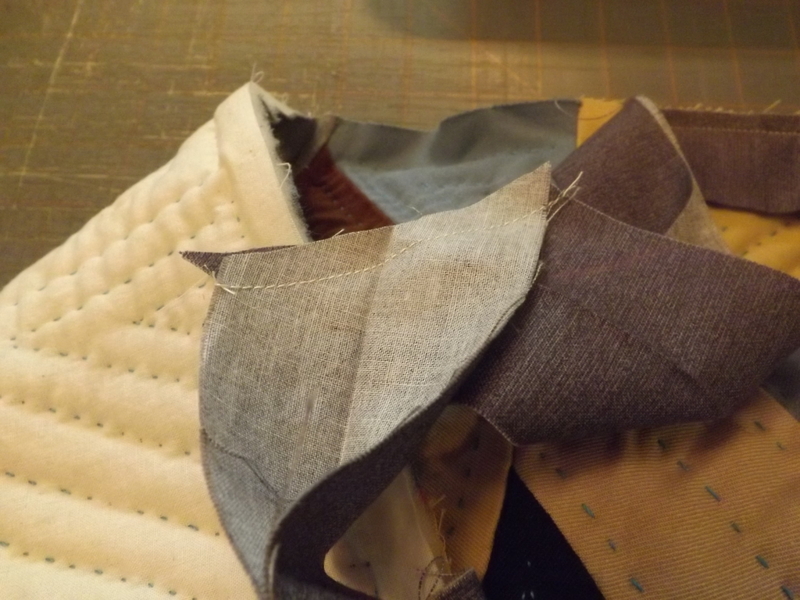 If a quilt has curved edges I use bias cut binding. I cut the binding 2.5 inches wide for this quilt. 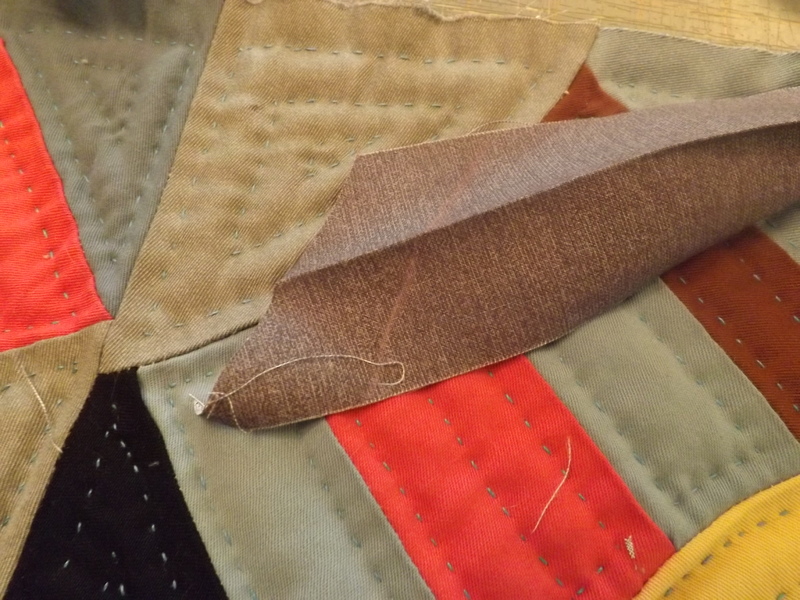 I sew the pieces together into one continuous strip , joining them at a 45 degree angle and pressing the seams open. 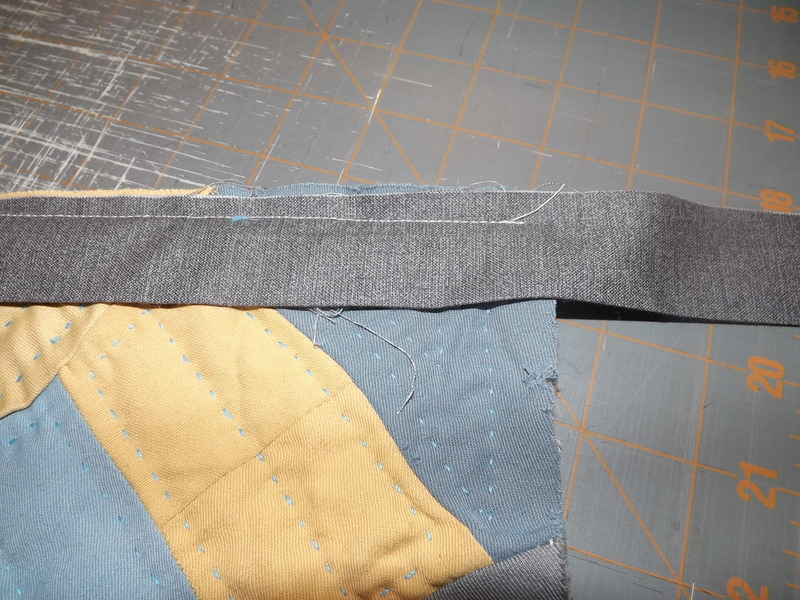 This keeps the binding smoother because the extra seams and fabric are distributed along the length of the binding rather than all at one place. Next I fold the binding in half and press. Now I sew the binding on to the quilt by machine. 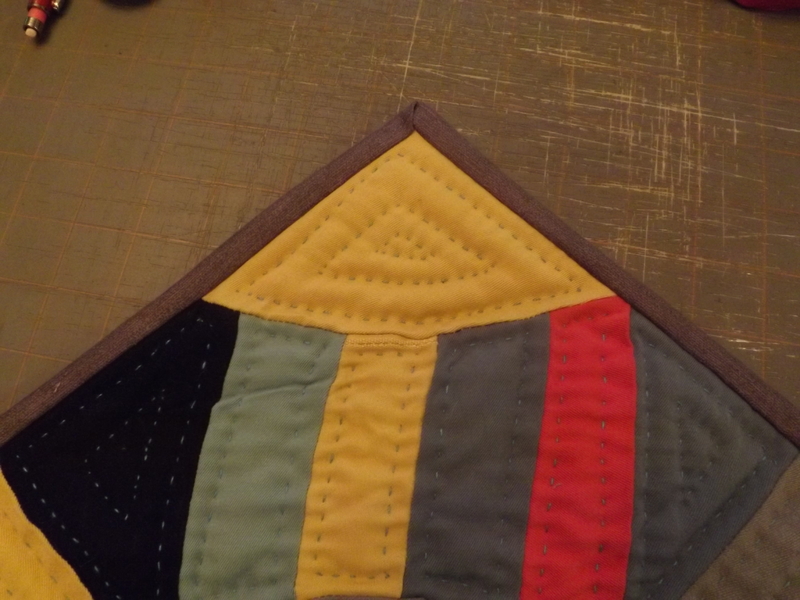 The binding goes on the top and the folded edge goes toward the center of the quilt. 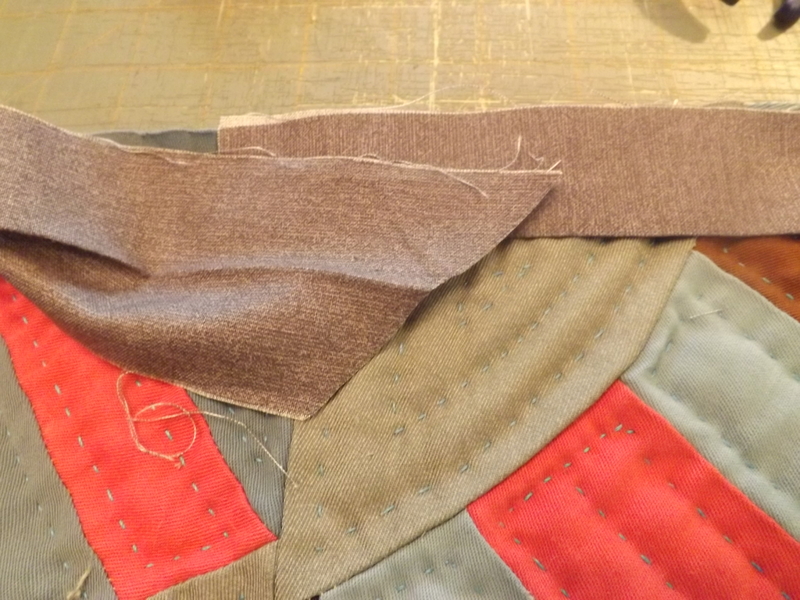 I start on one of the sides, leaving about one foot unsewn and then sew to the corner. 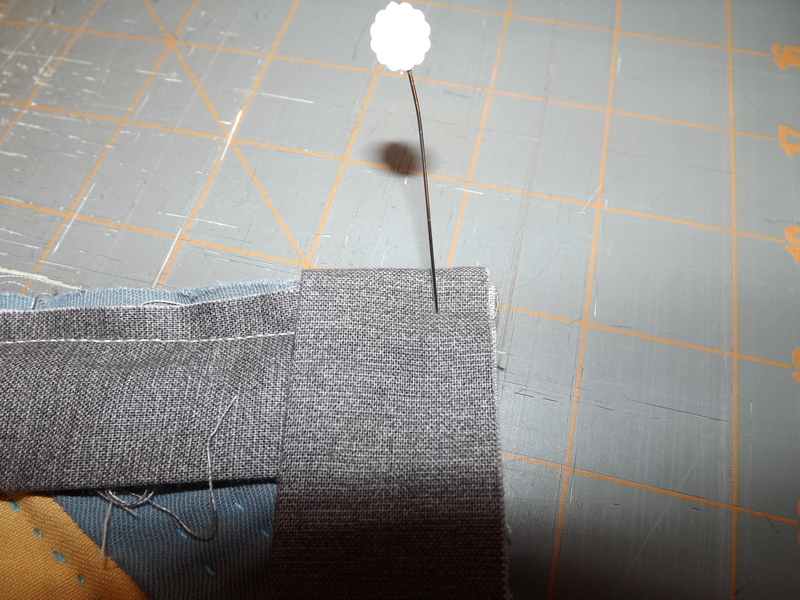 stop stitching at 1/4 inch from the corner. Back stitch to secure and then cut the thread. Now fold the binding up like this. Finger press it in place and then fold it down like this. Begin sewing again starting 1/4 inch in from the corner as marked here by the pin. 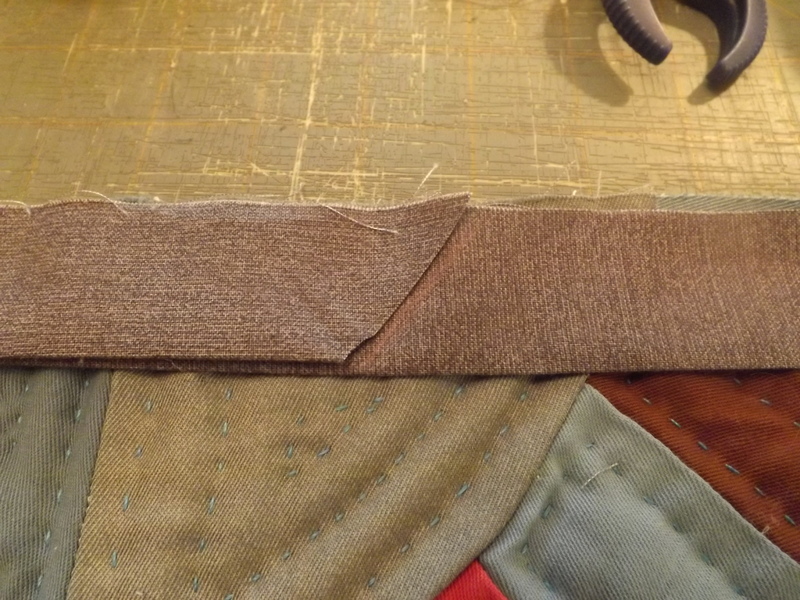 Continue around all the edges doing all the corners and stop about a foot from the end again. 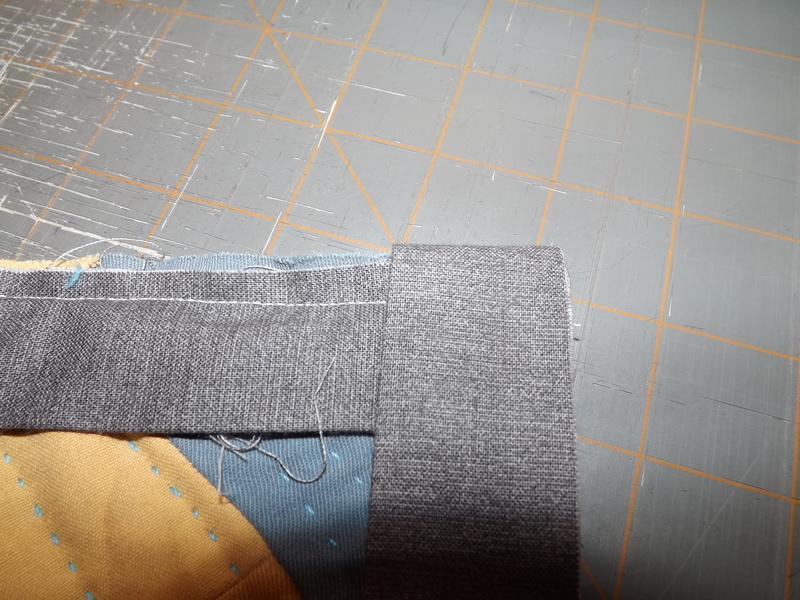 open that end up and mark it 1/2 inch longer (1/4 inch seam allowance for each side) and cut on the new line. 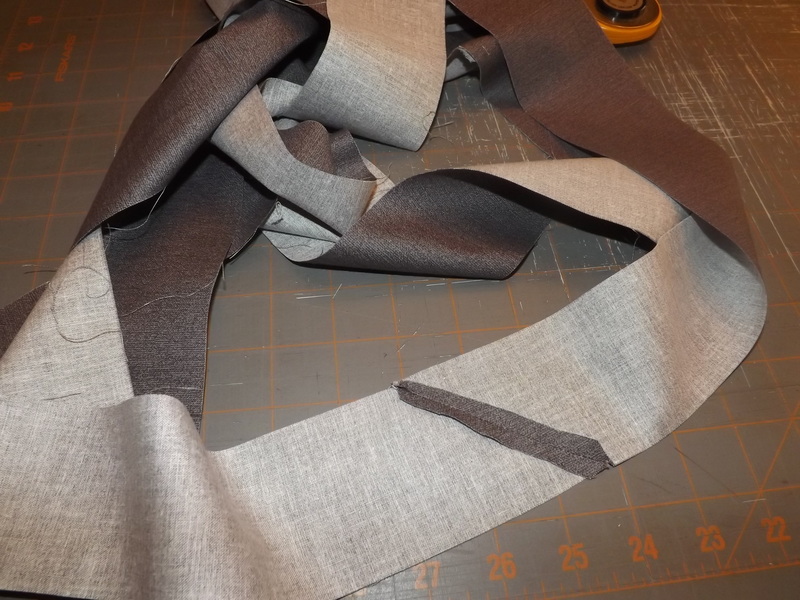 fold it back up and then sew this last few feet down. here it is sewn down with the binding pushed forward to show the top. 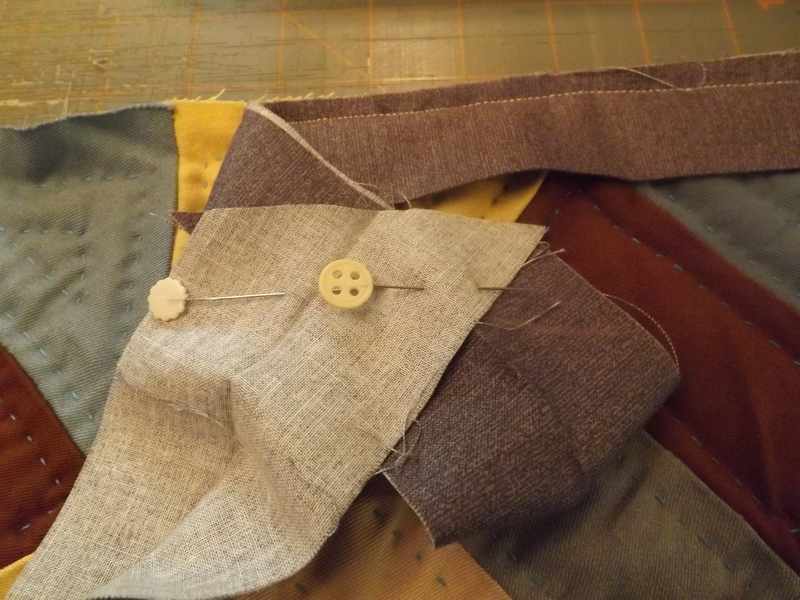 I use a few pins and move them as I go when hand sewing the binding to the back. 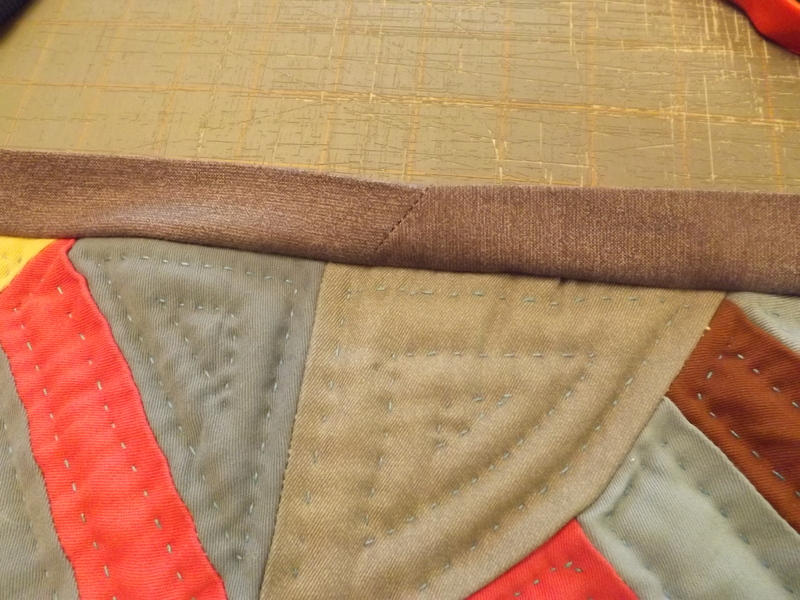 Fold the binding to the back of the quilt, pin in place and stitch to the back. 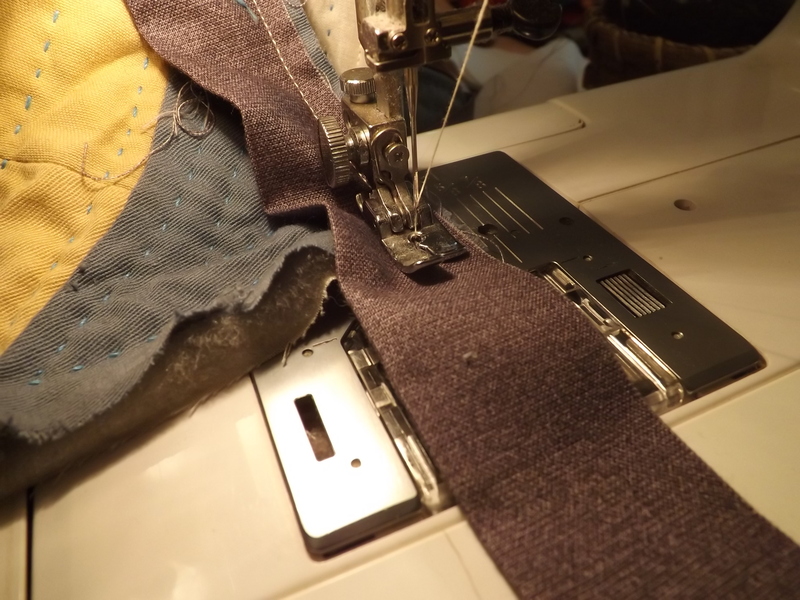 I stitch the binding down as close to the machine stitching line as I can. 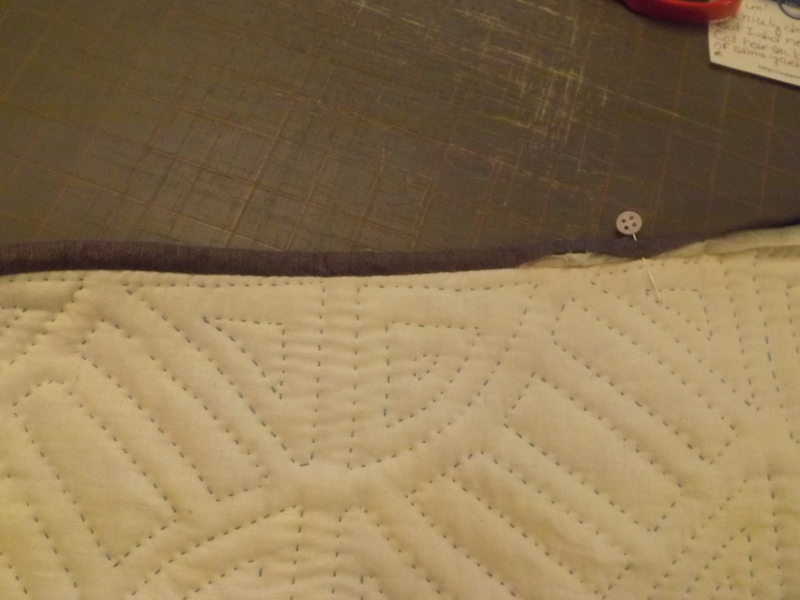 If you want it to be perfect you can stitch the miter closed. This quilt took me 6 hours to do the hand stitching of the binding, the machine part took a few hours to make the binding and apply it. 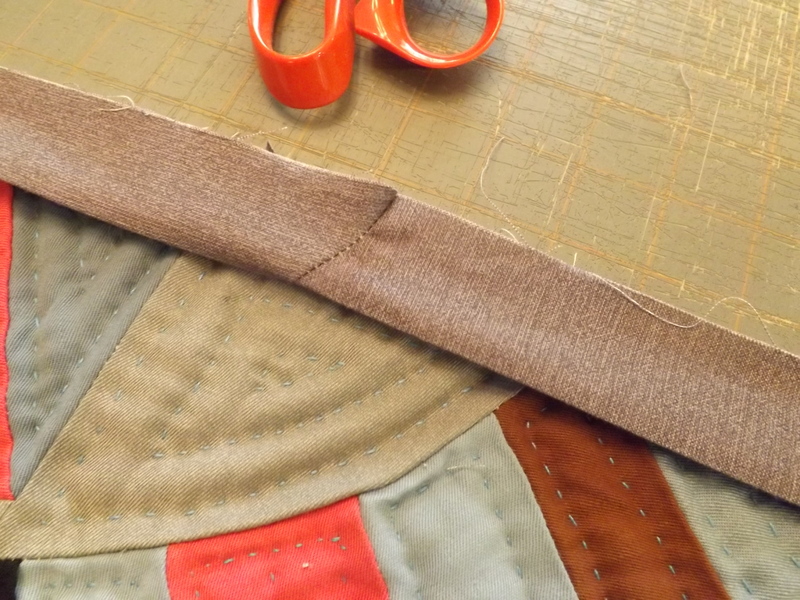 This entry was posted in Quilts and tagged binding tutorial, hand quilting, Quilting, Quilts. I love fact that you are hand quilting, great job on the quilt! 6 hours to do the hand quilting? Wow, you’re fast!!!! I’ve been quilting a generous twin-sized quilt for 5 weeks now (definitely not quilting every day, but quilting on average 4-5 days/week for about 4-6 hours/day) … and I’m not overquilting or quilting an intricate design either. Ah, that makes sense! Thanks for the clarification. Loved your description of the finishing of this lovely treasure from the washing to get that fresh clean smell and those vintage crinkles to the start to finish of the binding process. Great photos! and great job describing the process. I had to read the “6 hours” to do the binding twice thinking it was a misprint. 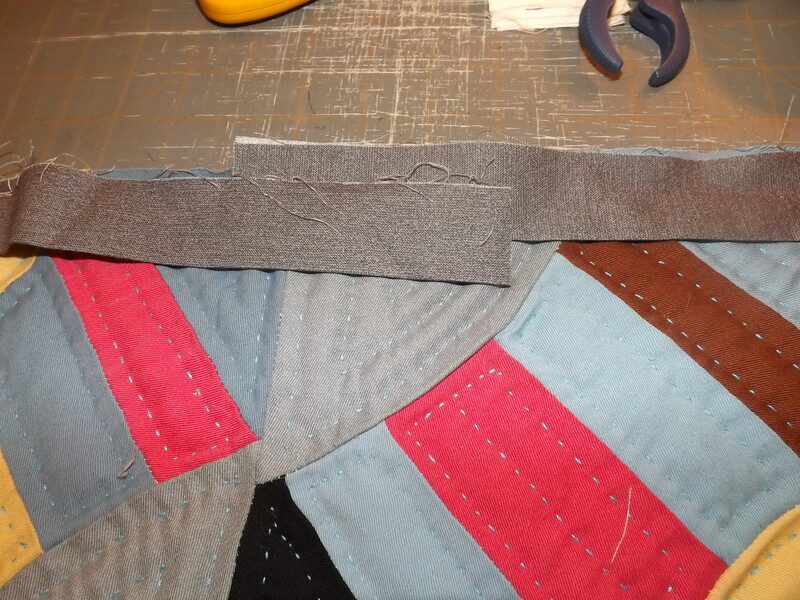 But I thought about how long it takes me to sew the binding on — which is a favorite part of the quilt making process because you’re on the home stretch! — 3 hours for a baby quilt. thank you,Tim. As a newbie, it was great instructional lesson on binding! Thanks!….Glad to hear that…and keep on quilting!! Tim your quilts just take my breath away.I love the color thread you chose to quilt with and the choice of fabric color.WOW! thanks!..this quilt seemed right for colored thread….I most often use white…. Now that’s a keeper, if I ever saw one! Excellent work, as usual. Thanks for sharing. Don’t forget to post it in the Quilt Gallery as well — is the Gallery up to date? You’re finishing quilts at such a clip, I don’t think it is. Great old quilt! So nice to have it finished, and the quilting looks terrific. 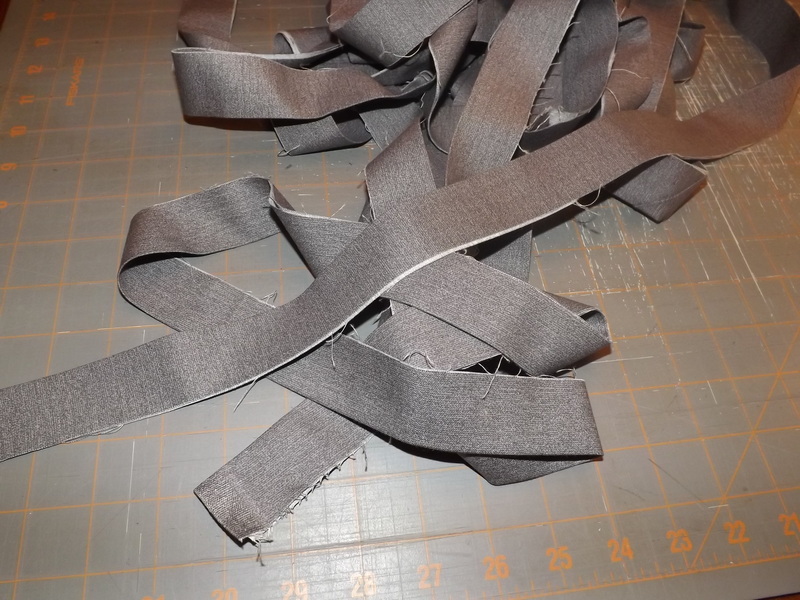 6 hours seems pretty good going to attach and sew down binding…you are a speedster! I like to use the little red Clover clips to hold the binding in place whilst sewing it down, no pointy pins to stab you! 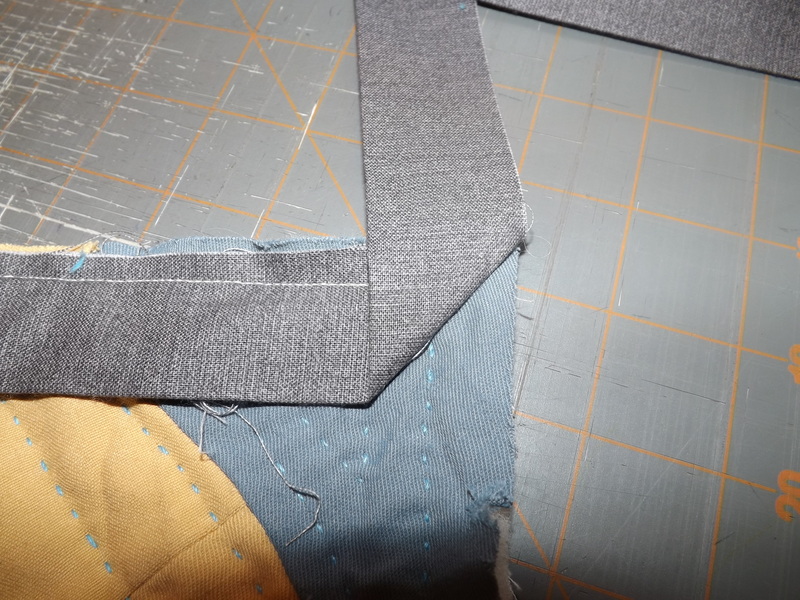 I also give the binding a light press on the front after the machining is finished, just to make that fold over to the back a bit neater, before starting to hand stich down. This was the best explanation for how to mark, measure and cut for the mitered end to the binding that I have ever read or seen! Thank you for such a clear explanation and demo. thanks, I cant tell you how many I messed up before I figured out this way to do it…the biggest mistake I made is cutting the angle without unfolding first…. I noticed that about your quilt Tim. It got happier and happier as you progressed. Lovely work. Thank you for that tute on sewing the binding. I always have difficulty with the ending and you make it sound so simple. I am at that stage now and will try it. It looks amazing! I love antique hand quilted quilts. Another triumph ! It looks super. You are the most prolific quilter I’ve ever seen, let alone a hand quilter! You need to post that Quilt Man photo somewhere on here,even if you have to include the source.